Thank you for interest in I.D. Energy’s DOE Approved and Award Winning Desktop Quality Assurance Program (DTQA). 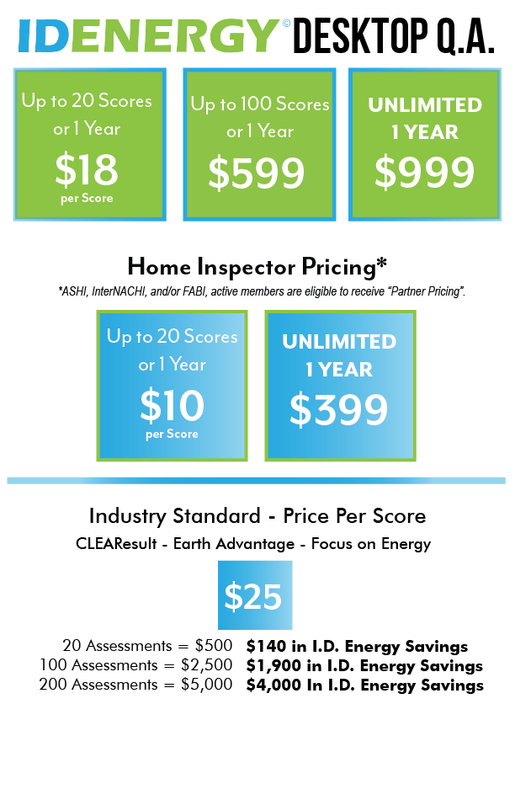 We are excited for you to be integrating the U.S. Department of Energy (DOE) Home Energy Score into your services! Prices Per each individual Assessor. Advanced purchase required. Price per assessment submitted by assessor, not per QA report. 1 Year expiration for Unlimited QA from purchase date. For Per Score – 20 Score minimum – 1 Year expiration on assessments from purchase date, or until you reach 20 submitted assessments, or the amount of assessments (20-100) purchased. Each Score submitted will be tracked accordingly and QA will be performed on at least 5% by DOE requirements. QA reports returned to assessor will include detailed feedback by an approved DOE auditor. Approved DOE Auditor will submit a QA report directly to the DOE when performed. Profile, and instruction to the Home Energy Scoring Tool on Paperless Inspectors and I.D. Energy’s Mobile App. Includes Technical and Program Support. Includes access to I.D. Energy’s Exclusive Marketing Suite and Certified Assessor Resources. Access to personal training and webinars for additional cost if requested.